The singer and her new man have been inseparable ever since the end of her engagement to billionaire ex James Packer late last year (16), and for the first time in an interview she has referred to Tanaka as her boyfriend. Asked to talk about the rumoured romance in an Associated Press chat on Wednesday (15Feb17) after posting a shot of herself and the dancer drinking champagne in a bathtub on Valentine's Day (14Feb17), the superstar said, "I really don't talk about my personal life, because that's what I used to do and it really worked for a minute, back, a while ago. I just don't feel comfortable talking about my personal life... Me and my boyfriend don't want to do that." It's the first time she has referred to Brian as her boyfriend. Since splitting from Packer, she has been on vacation with the dancer and he has been regularly featured on her docu-series Mariah's World. He will now be getting ready to join the singer on tour as she hits the road with Lionel Richie next month (Mar17). The North American tour will run until 27 May (17). 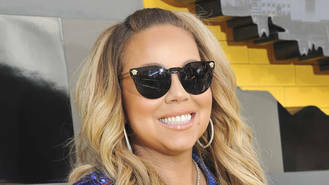 The new couple will be joined by Carey's twins, Moroccan and Monroe, from her marriage to Nick Cannon. "Roc and Roe do get to come," she said. "They love to go onstage and actually they are very musical already. They have their school, and they have their teacher. They are doing really well but they don't love the school, let's just put it that way. But they are happy when they get to go with me on tour and there's other kids there, too, so it's good."